It is not a totally new way of food production. Aquacultures were already used by several ancient populations for food supply. During the last decades, this production spread more and more all around the globe and especially the production of fish increased constantly. During the World Business Conference on Aquaculture in Stavanger, Norway last week, high importance for the worldwide fight against poverty and hunger was credited to aquacultures. understood to mean the farming of aquatic organisms including fish, molluscs, crustaceans and aquatic plants. Farming implies some form of intervention in the rearing process to enhance production, such as regular stocking, feeding, protection from predators, etc. Farming also implies individual or corporate ownership of the stock being cultivated. Former General Secretary of the United Nations, Kofi Annan, was main speaker at this year’s World Business Conference on Aquaculture in Norway. For three days, 430 delegates from around 33 different countries came together in Stavanger to discuss the future of aquacultures and to exchange stories about current developments and technologies in the industry. In his speech, Annan addressed the gathered delegates to join hands and tackle the problem of world hunger. He illustrated what importance aquaculture production has for the food production and the reduction of hunger in future decades. Particularly against the background of an increasing world population, Annan asked the world’s major aquaculture companies to contribute their part to the further development and cooperation with small-scale producers especially in Asian and African countries. These small producers need to be enabled to participate in the world’s aquaculture development and additionally need to get access to export markets in order to contribute to a decrease of hunger. Experts expect the world population to be about nine billion people in 2050. While we struggle already with feeding seven billion nowadays, it becomes necessary to think about alternative and additional sources for food production. Aquaculture production is such a source which can contribute a lot to an increase of sustainable food production worldwide. 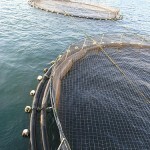 Fisheries and aquaculture have the capacity – if supported and developed in a regulated and environmentally sensitive manner – to contribute significantly to improving the well-being of poor and disadvantaged communities in developing countries and to achievement of several of the Millennium Development Goals, especially those related to poverty reduction and food and nutrition security, environmental protection and biodiversity. 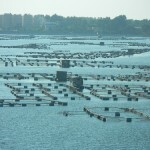 This leads to other advantages of aquaculture food production. If used properly and sustainable, it can also contribute a lot to environmental protection and biodiversity. Particularly the worldwide phenomenon of overfishing, which affects many waters around the globe , can be dealt with. 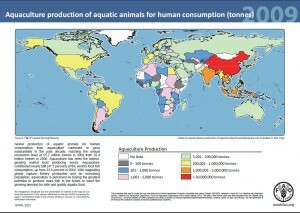 Statistics show that African countries are still at the very beginning of implementing aquaculture production. But as in many fields, generalizations can be misleading here. While the annual fish production from aquacultures compared to other world regions is still quite low, there are a few countries which are shining examples for aquaculture production in Africa. With the highest annual production, Egypt can be followed by other African countries in order to implement increasingly aquaculture systems. But also Uganda, Nigeria, Cameroon and Malawi can be taken as examples how aquaculture production can successfully contribute its part to a more sustainable food production. 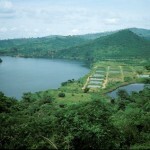 Especially the case of Malawi shows how effective the introduction of small-scale fish ponds can be. 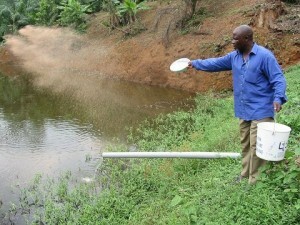 After the introduction of this fish production, income of local communities increased by 60 percent. Taking these cases as examples, other regions increasingly introduce aquaculture fish production, since it improves sustainability and productivity of food production enormously. Especially in coastal regions or areas where big lakes and rivers are located, aquacultures are on the rise. Hopefully the cooperation between big global aquaculture companies and small-scale farmers and communities as Kofi Annan demanded it in Stavanger will be recognized and followed in future. Only in that way, sustainable and sufficient food production all around the globe can be achieved.